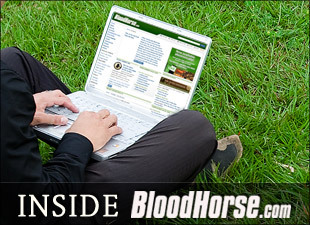 Earlier today, we transitioned into a new phase of the BloodHorse.com homepage redesign. You will notice a completely new look for the Racing, Breeding, and Sales sections of the homepage. We've made it easier to access race results, entries, sire lists, and sale results. In addition, we've added an embedded video player on the homepage that provides quick and easy access to our race replays. Each section also includes a "Features" box that will include content such as video, blogs, or a special report. The scrolling arrows can be used to quickly browse multiple features that have been assigned to each section. This functionality allows us to feature several pieces of content within a small section of the homepage. Our intention is to remove as much clutter from the old homepage as possible, allowing our readers to quickly access the content they are interested in. As always, we welcome all feedback and look forward to hearing your thoughts.